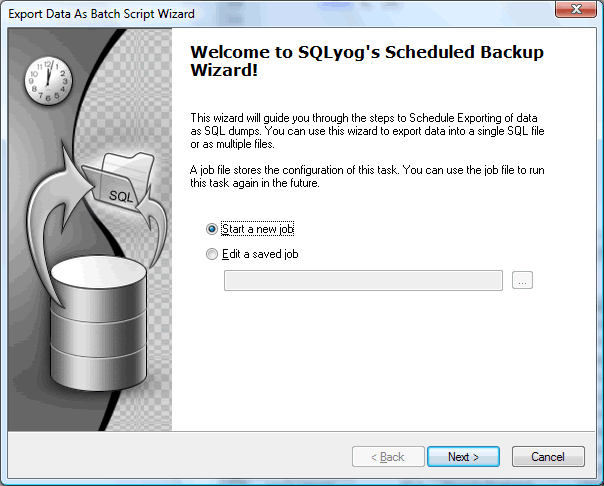 SQLyog's Scheduled Backup Wizard allows you to schedule Exporting of Data as SQL Dumps. You can use this wizard to export data into a single file or as multiple files. This page allows you start up a backup session or to edit an existing session. Select Start a new Session and click Next to start a new backup session. 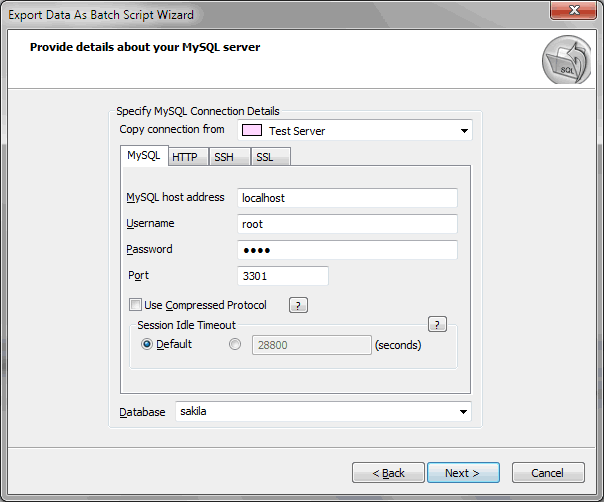 In this page you need to provide details about your MySQL database. For more information on how to connect to MySQL servers click here. There are also are two different options to backup ALL databases (but it will of course only backup the databases that this user can access on the server). One of those options include the `mysql` database and the other does not. You should be careful about backing up and restoring the `mysql` database unless you are the server administrator. For most users best option is to backup 'ALL user data' (without `mysql` database). Note that both ALL options will not backup the Information_Schema database and Performance_Schema. These databases are read-only databases and cannot be restored. However ,if you want, you may select it individually for export.